ROME (CNS) — As the church is set to begin the Year of Faith and a synod on the new evangelization, the rosary can play a key role in strengthening and spreading the word of God, said a leading American expert in Marian studies. “This Year of Faith is a call for evangelization, a new evangelization that's to start with ourselves” in reawakening one's love for Christ and then reaching out to those who have become distanced from the church, said Holy Cross Father James Phalan, director of Family Rosary International. October is the month the church dedicates to the rosary, and the world Synod of Bishops will start Oct. 7, the feast of Our Lady of the Rosary. Pope Benedict XVI entrusted the synod to Mary's intercession, and he has said the rosary can stimulate missionary activity by leading Christians to meditate on the life of Jesus. “During this Year of Faith we're to take up the rosary in our hands again,” Father Phalan told Catholic News Service during a visit to Rome in mid-September. Praying the rosary together, especially for a family, has added beauty and power, he said. “It opens up areas of sensitivity, areas of intimacy” because “prayer is one of the most intimate things we do,” he said. When couples or families pray the rosary together, “there's a real intimacy that's bonded in faith” that then fortifies relationships and solidifies the wider Christian community, he said. 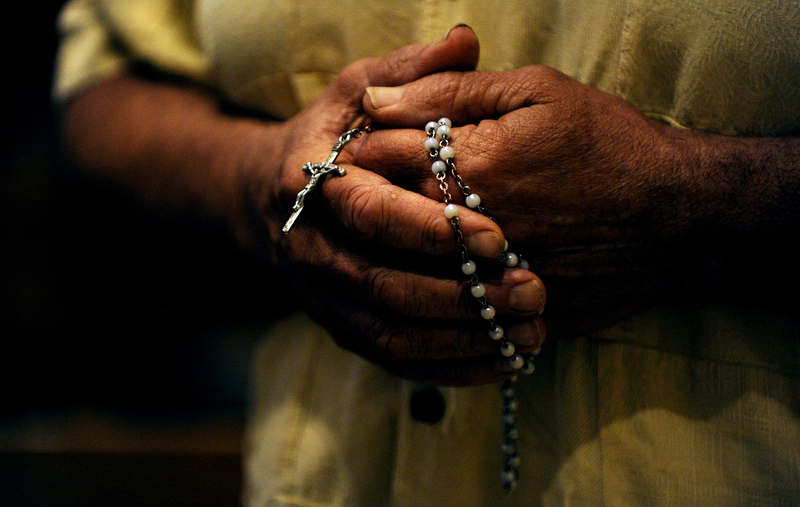 The rosary has been “a tried and true” way to strengthen Christian life in the home and to pass on the faith from generation to generation, he said. “I'm convinced that when we talk about the new evangelization, we need to talk about evangelization in the home,” because unless one's prayer life and faith are reignited there, “it 'ain't gonna' work, frankly,” he said. Reawakening the faith in the home is not only a very effective way to develop a solid base for evangelization, it also helps families during troubled times, he said. Family Rosary International was started by the late Holy Cross Father Patrick Peyton, who coined the phrase “A family that prays together stays together,” as part of his mission to build family unity through the daily recitation of the rosary. “He knew that something really simple” like prayer in the home could make a big difference in facing problems that seem so complex and difficult, Father Phalan said. “Our work continues on his simple but profound insight, which is more important than ever, that family prayer can do so much in the face of the apparently chaotic situations of so many families,” he said.